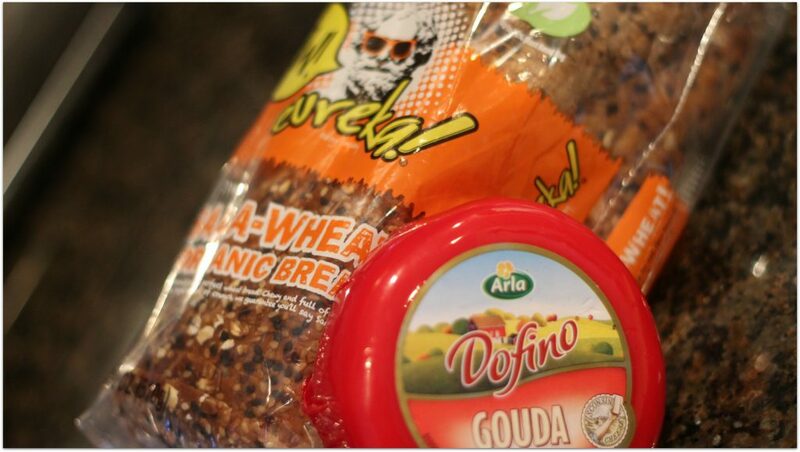 Making my family happy makes me happy, and the meal I made with Arla Dolfino Gouda Cheese and Eureka SAAA-Wheat Bread put huge smiles on their faces! Let me begin by introducing you to Eureka Organic Bread. Oh my word. I can’t even tell you how much I love this bread! It’s nutty and delicious all by itself, and it’s healthier as it’s organic. I found it right on the shelf at my local Publix, which makes it so convenient to pick it up whenever I’m shopping instead of having to go to a specialty store. Add Arla Dolfino Gouda Cheese to this bread and it’s heavenly! Arla Dolfino is just naturally good cheese, and I always try to choose the healthiest options I can find. 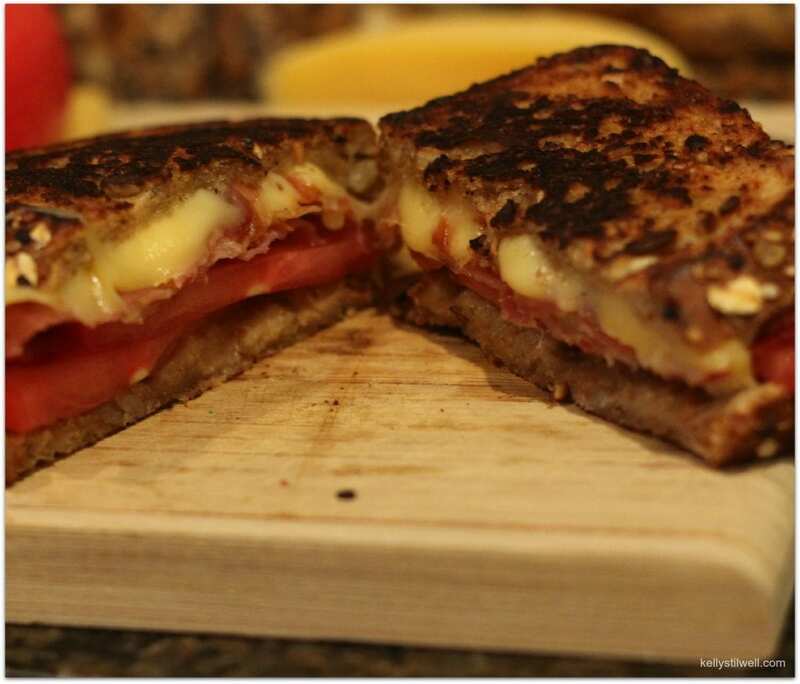 I wanted to take a regular traditional grilled cheese and kick it up a notch by adding crispy prosciutto. Let me tell you, this is the easiest and most delicious dinner I’ve made in ages! 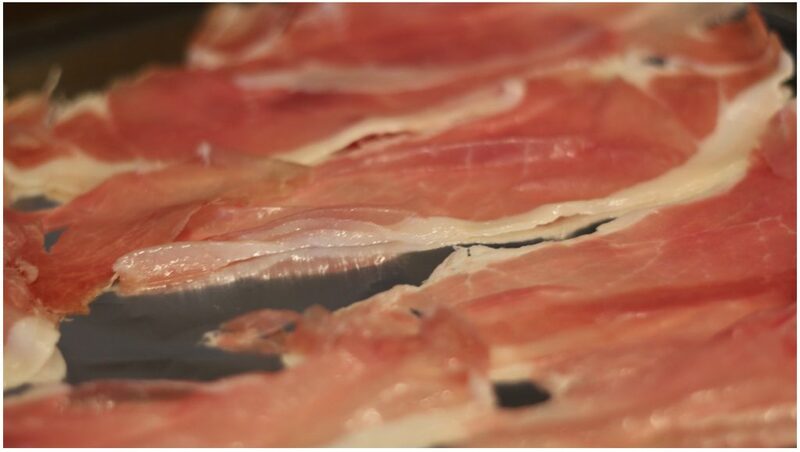 Begin by crisping up the prosciutto in the oven. 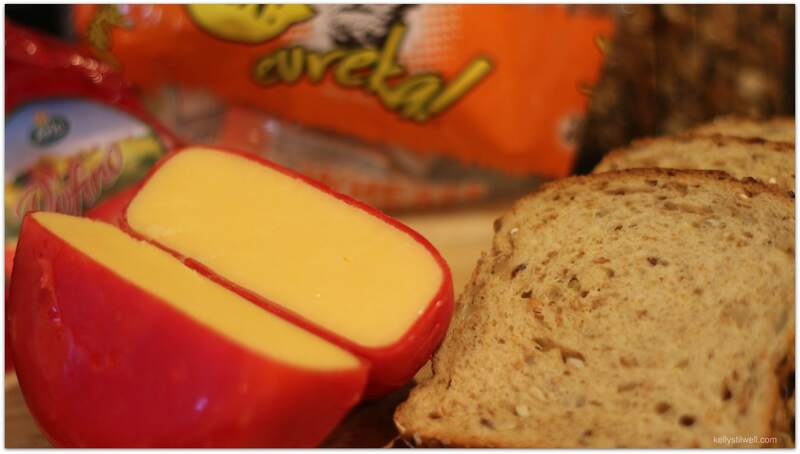 Spread the bread with a thin layer of butter and a layer of thinly sliced cheese. 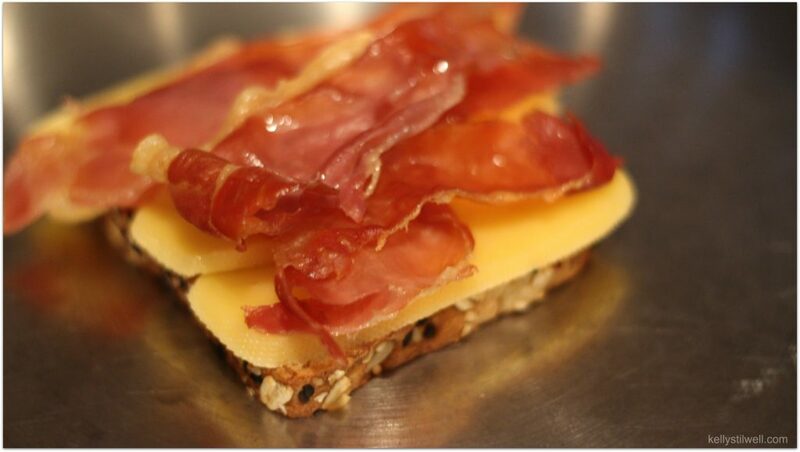 Place the crisped prosciutto on top of the cheese and top with the other piece of buttered bread. Lightly butter the tops and bottoms of the bread, and grill until just lightly browned. You can serve this just as is. Or add tomato, which is my favorite. 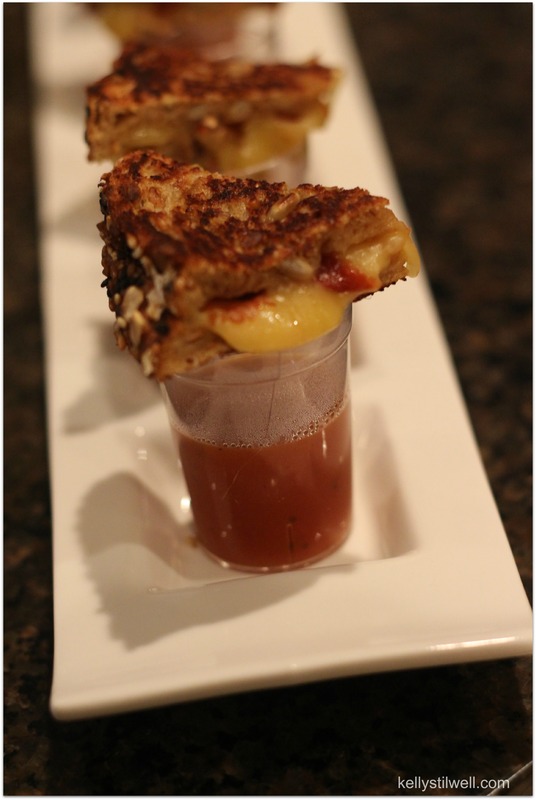 But if you want to wow your family and friends, cut the Grilled Gouda and Crispy Prosciutto sandwiches up into triangles, and place over little shot glasses of tomato soup. This is serious #GooeyGoodness! 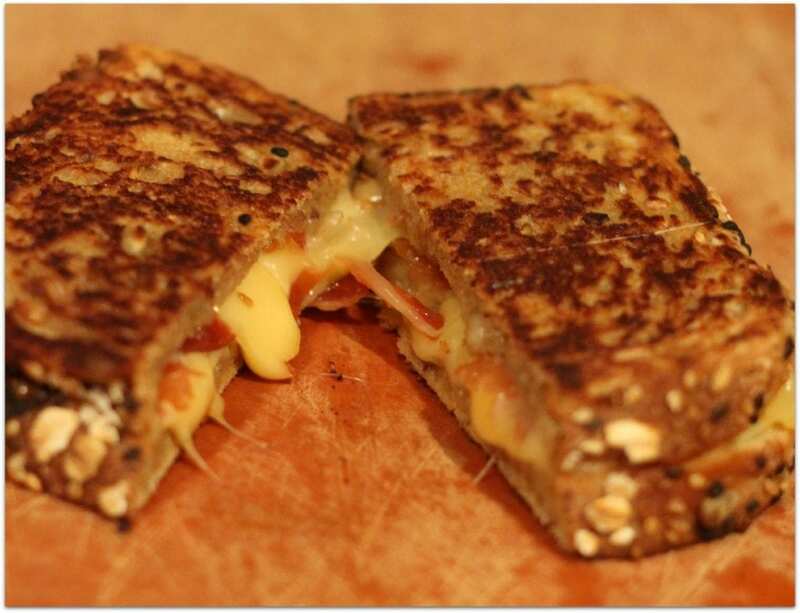 Now that you’ve seen how we eat grilled cheese, what’s your favorite grilled cheese recipe? I love gooey goodness because it is so delicious to my taste buds. Also it is a quick food to fix that will get eaten up by most anyone. I love ooey gooey cheesy goodness tucked between amazing bread like this. It’s like comfort food at it’s finest! Looks absolutely delicious! I have got to try it out. I tried everything, to get this grilled cheese off my screen and into my mouth! Oh man.. Anything that is “gooey goodness”, is just worth having a lot of. YUM! I like Gooey Goodness because I’m a foodie! The gooey goodness of cheese is the perfect comfort food – whether in a grilled cheese sandwich or melted over a bowl of onion soup or on a pizza – always yummy! Gooey Goodness makes any meal special. Looks delicious! And I love how simple it is to make! I love #gooeygoodness because it’s a crowd pleaser! So easy to make too! If I’m making a huge batch of ooey gooey grilled cheese sandwiches, I will preheat the oven to 200 to keep them warm as the others grill up on the cooktop! 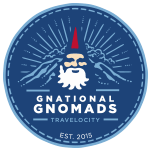 Ronald, you are the winner for the prize pack! 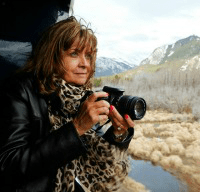 Can you send me your address to kastilwell@gmail.com? Thank you and congrats! This is one that everyone would love. Got to give it a try some time! 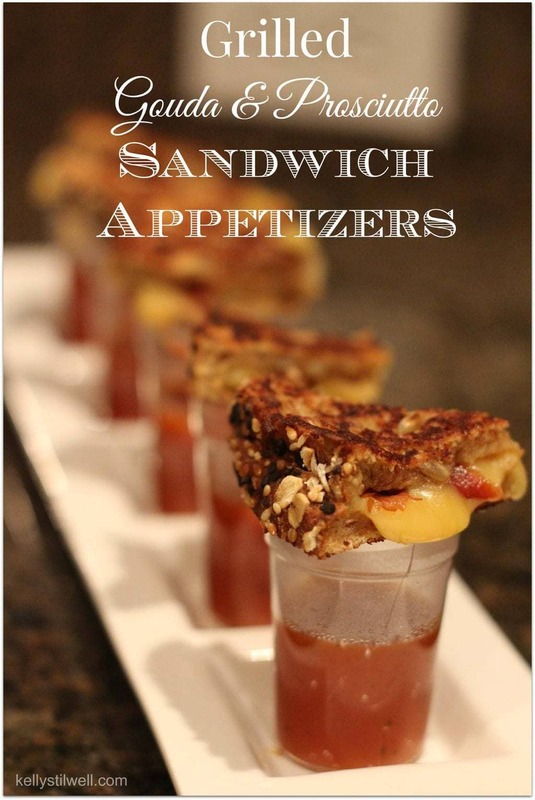 I must be crazy since I have never tried gouda before.. those look absolutely delicious! What a nice set up! Perfect for hosting an event or party! Hello to all, the contents present at this web site aree in fact amazing for people experience, well, keep up the nice work fellows.